There are thousands of different types of rice, all with unique flavours and textures. 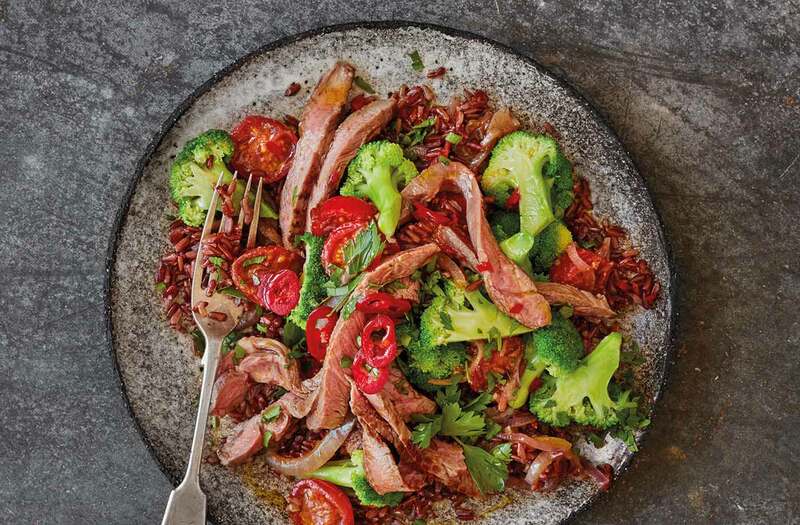 Red rice has a mild, nutty taste that pairs brilliantly with this fiery spiced lamb dish. Warmed with cumin and chilli, and balanced with cool tzatziki, this dish delivers a mighty flavour-kick. Bring the stock to a rolling boil in a large pan. Add the rice; boil for 30-35 mins until tender. When the stock’s almost absorbed, reduce the heat to low. Meanwhile, heat the oil in a large, deep frying pan over a medium heat. Fry the onion and spices for 5 mins, then add 1 tbsp garlic and ginger paste and a splash of water; cook for 10 mins. Add the tomatoes, broccoli and a little water and increase the heat to high. Cook for 5 mins until the broccoli is just cooked. Stir in the rice and set aside. Meanwhile, heat a nonstick frying pan until very hot. Rub the remaining garlic paste and some seasoning over the lamb, then sear for 3 mins each side for medium rare or 4 mins each side for well done. Rest on a board for 5 mins, then slice. Stir the lemon juice, parsley and chopped chilli into the rice. Serve with the lamb, garnished with sliced chilli, and yogurt or tzatziki, if you like.